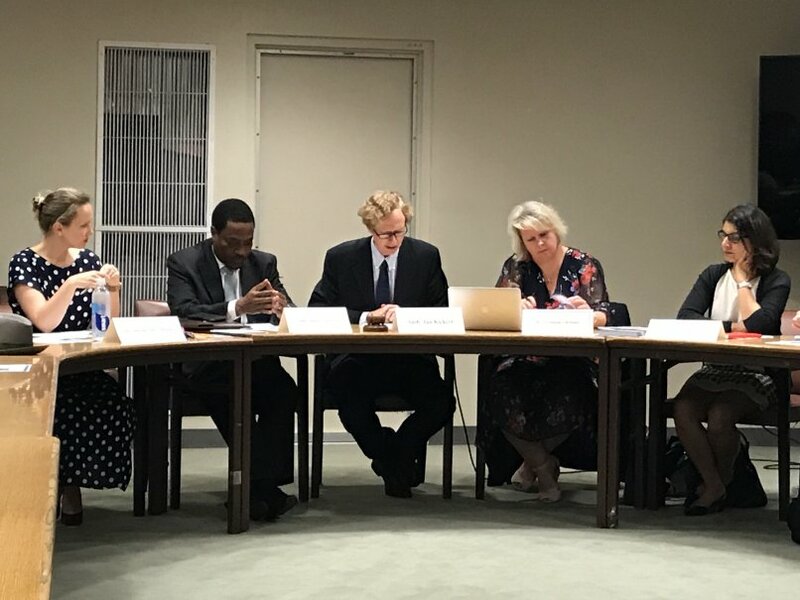 The first event, held on May 22 at UN headquarters in New York, was a ministerial-level open debate on the protection of civilians in armed conflict held by the UN Security Council. The second was a a side event on “Protecting Civilians from the Use of Explosive Weapons in Populated Areas” held on May 23 and co-convened by the International Network on Explosive Weapons (INEW) and the permanent missions to the UN of Austria, Ireland, Mexico, and Mozambique in New York and chaired by Austrian ambassador Jan Kickert. After reporting on the views of numerous stakeholders on protecting civilians in armed conflict, HRN called on international actors including representatives from states and civil society to take the stakeholders’ accounts into consideration and make efforts to end the ongoing serious violations of human rights and international humanitarian law (IHL) in armed conflict around the world. HRN also urged the international community to prevent further human rights and IHL violations by raising alarms and condemning them when they occur, as well as by taking steps towards justice and accountability by creating independent commissions of inquiry and bringing cases before the International Criminal Court (ICC).